and created a network for information. Performing Arts Center. Over the years, as circumstances changed, we occupied a number of venues, including The Famous Rider Cultural Center, a conference room in the Joyce Building, and City Books. Since 2011, we have been comfortably ensconced at the Brentwood Public Library. Despite the fact that workshop members represent varying degrees of poetic expertise, we operate as equals. It’s a great place for poets from novice to master to get helpful comments and feedback on their work. In the last 40 years, dozens (hundreds?) of poets have passed through the workshop. Among those who became nationally known would be Joan E. Bauer, Mike James, Joseph Karasek, Joy Katz, and Arlene Weiner. An open workshop necessarily produces poems ranging from great to awful, but there has developed an agreement that the general level of poems has never been higher than now. This was acknowledged by Gene Hirsch a few months ago when he suggested we should publish an anthology. This, dear reader, is what you hold in your hands. 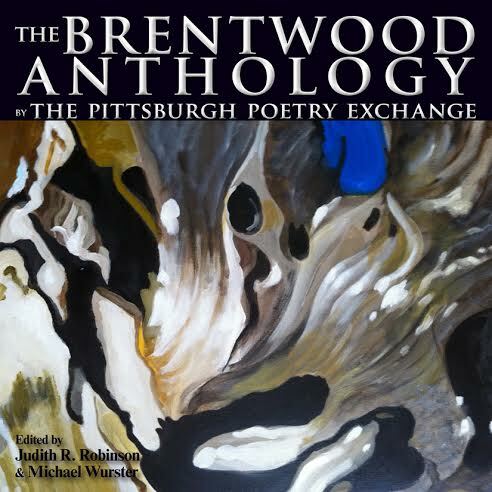 Pittsburgh Poetry Exchange Brentwood is not a historical anthology, but a collection of poems from the workshop now, its current members. We hope you enjoy it as much as Judy Robinson and I enjoyed putting it together. The roster of poets: Michael Albright, Joan E. Bauer, Jennifer Jackson Berry, Ziggy Edwards, Timons Esaias, Mark Goldman, Barry G. Govenor, Johnny Hartner, Gene Hirsch, Joe Kaldon, Sheila Kelly, Kathy McGregor, Jolanta Konewka Minor, Edward Murray, Stephen Pusateri, Judith R. Robinson, Nick Romero, Lucille T. Seibert, John Stokes, Christine Telfer, Arlene Weiner and Michael Wurster. We are grateful to our wonderful city, a lively home for art and artists. Pittsburgh has long been a hub of happenings. With its beautiful topography of hills and rivers, its interesting history as well as its unique ethnic mix of people, Pittsburgh itself continues to offer so much that nurtures us. A thank you goes to the Brentwood Library, our gracious hosts, and to Barry Govenor who serves on the Library’s board of directors and is one of our group. The library furnishes us with comfortable space, tables, chairs and coffee; every comfort to support our insatiable habit of meeting each month to workshop poetry. We of the Pittsburgh Poetry Exchange are grateful to our founder, Michael Wurster, for his many years of mentoring every one of us. We have benefited more than can ever be expressed from his expertise, his guidance and his loyalty to poetry and to us. Finally, I personally wish to thank my fellow workshoppers for their unending humor, friendship and always fine-tuned opinions. We have all enjoyed many years of listening, sharpening skills and advising one another on the countless aspects of our shared passion, poetry. Thanks, Guys! Mail Orders from the USA, only, can be sent to Lummox c/o PO Box 5301, San Pedro, CA 90733…PLEASE make checks out to Lummox Productions. This entry was posted in 2014, Book, Merchandise and tagged anthology, pittsburgh poetry, Pittsburgh Poets, poetry on August 20, 2014 by bookdog.